On Jan. 28, 2015 I received an email which was a terrible shock. My thoughts and prayers are with you all in light of this tragic and shocking news. I had the distinct pleasure of making comics with Steve back in the 1980s when we were both young and unafraid. We collaborated on dozens of projects and I was always in awe of his talent and humanity. Our communication has been spotty over the past few decades, but I have always counted him as one of my friends, and was honored that he reciprocated those feelings. I will miss him -- it's as though a familiar guiding star in the vast night sky has suddenly dimmed and the firmament is diminished by its absence. I will miss you, my friend. I will always remember the fun I had making comics with him. 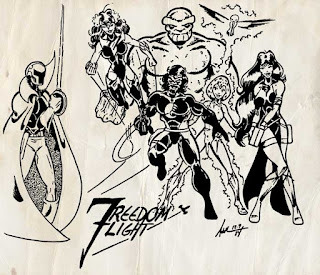 Even back then, his talent as a penciler and inker were head and shoulders above what everyone else was doing in fanzines at that time. I met him through our mutual involvement in the COLLECTORS' CLUB NEWSLETTER, where I was group president/editor. That quickly led to a friendship that lasted for a very long time. We collaborated on a dozen small comics projects and he was, by far, one of the best people I've known in terms of talent, skill and humanity. fertile imagination during the early 1980s. Time isn't our friend, though, and we drifted apart during the early 1990s into our different versions of "the real world." When we reconnected back in the early 2000s, he was a different man. Angry at many things that had happened. But that didn't diminish his talent, and we conversed frequently for a year or two until we both drifted away again. I probably hadn't spoken to Steve for two or three years when I contacted him in Sept. 2014. I had been going through my files and found a large stack of unpublished artwork he had drawn for me for a superhero I had created. In 1983 & '84, Steve had graciously penciled and lettered the 20-page comic book story for me, and apparently I had even gotten the first 11 pages inked by a teen-aged friend of ours who is now a professional inker for companies like Bongo and Archie: Andrew Pepoy. I contacted both Steve and Andrew about allowing me to blow the dust off this project from our wayward youths and let it see the light of day. Both Steve and Andrew agreed, and they both agreed (both making me swear to remind everyone how young we were when this was created: I was about 19, Steve was 24 and Andrew was 16 or 17). When finished, the book will be available through Drive-Through Comics and Ka-Blam. I was working on this book last night before I heard the terrible news about Steve's passing. His wife Ellen found my contact info and sent me the news. I'm really in a bit of shock. I knew he had some health issues (as do I -- as I said, time may be our constant companion, but it is not our friend), but I just thought he would be there to see this book come out and let him see all over again how much he meant to people and how much he was respected as someone who truly was touched by the hand of God and granted The Gift of being an honest-to-gosh real Artist (and yes, that's with a capital "A"). I miss him now, and I know I will miss him more as the days go by without him. My condolences go out to all of his friends here, and to his family (His wife, Ellen, will now receive the royalties from the book, FANZINE FLASHBACK: ULTRA #1). I've shared the news with people from the Collectors Club (it's still around and has a Facebook group where we talk about comics and art and all the geeky stuff that seems so important until something like this happens to remind us of what really matters). If you're on FB, search for us as the Collectors' Club Newsletter Group.